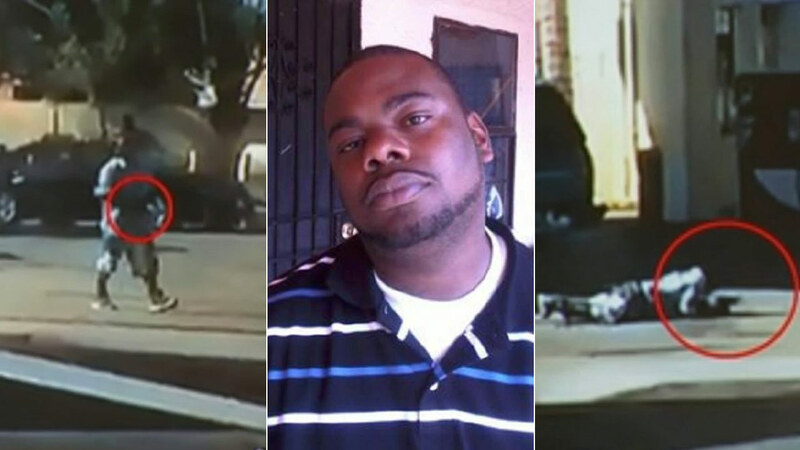 LYNWOOD, CA -- A black man who was fatally shot by Los Angeles deputies kept holding a gun as he lay dying on the ground, authorities said Sunday in response to questions about why they continued to fire on the man after he fell to the pavement. Witnesses told authorities that Robertson reportedly fired six to seven rounds and briefly went into a car wash and a pizza parlor before deputies arrived. The gun was not registered to Robertson and has not been reported stolen. Detectives are trying to track it, Katz said. Robertson may have been in a dispute at home with his spouse before he went out on the street, but authorities have yet to verify that, Katz said. Video, apparently from a cellphone, appeared on several media sites. It appears to show deputies firing some two dozen bullets, including several rounds after Robertson falls and is crawling on the ground. Robertson's death comes at a time of increasing criticism of police use of force after several killings of black men by officers have been caught on video in California and throughout the nation. On Dec. 2, five San Francisco officers shot and killed Mario Woods, 26, in the city's gritty Bayview neighborhood after they say he refused commands to drop an 8-inch knife he was carrying. Police were responding to a stabbing report when they encountered Woods.